New road studs on the A1 in Berwickshire. Eleven thousands homes between Grantshouse and Berwick are about to receive a questionnaire asking for residents’ views on the impact of the A1 solar powered LED road studs at nine junctions. The questionnaires are part of Edinburgh Napier University studies into gauging drivers’ awareness of the new studs and their attitude to them, and as Berwickshire motorists are the most likely to be using the junctions on the A1 between Gransthouse and Berwick it makes sense for researchers to hear what they have to say. The road studs were installed at nine key junctions of the mostly single carriageway stretch of the A1 in Berwickshire after motorists reported difficulty seeing some junctions after dark. The LED studs, installed in the winter of 2015/16, can be seen from 700 metres away, almost seven times the range of traditional cats eyes. Another problem faced by motorists is that, when making a right turn, darkness robs them of reference points like trees and road signs to gauge the speed of oncoming traffic, leaving them looking only at a pair of headlights. 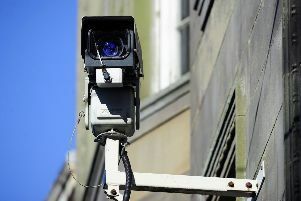 Data has been gathered from new video recordings of drivers manoeuvring at junctions and this will be analysed along with radar gun spot speed surveys to build up a picture of motorists’ behaviour in the area. The studs have also be installed at Sheriff Hall roundabout on the Edinburgh City Bypass and a decrease in accidents has been seen; motorists using the studs as a guide to stay in their own lanes.